Infraspinatus muscle originates from the medial two-thirds of the infraspinatous fossa by tendinous fibres from ridges on its surface. The infraspinatus fascia also marks its origin and separate the muscle from teres major and teres minor. Infraspinatus muscle fibres converge to create a tendon, which enters across the shoulder joint to be inserted on to the posterior aspect of the greater tubercle of the humerus. Infraspinatus bursa sometimes separates the tendons of infraspinatus muscle from the capsule of the shoulder joint. 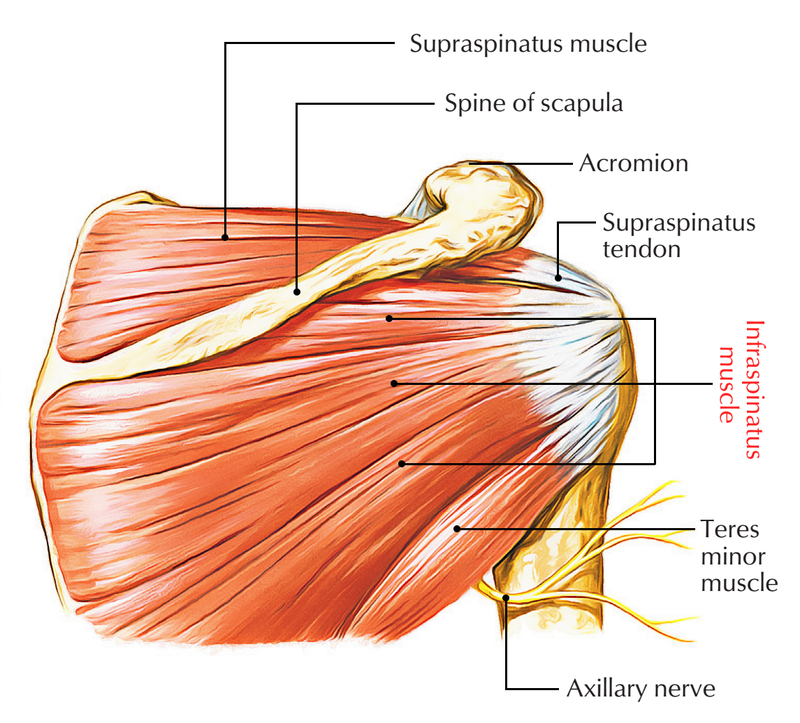 The infraspinatus muscle is supplied by the suprascapular nerve (C5 and C6). The infraspinatus is the major muscle that facilitates external rotation of the shoulder joint. It helps in lateral rotation of the arm and stabilizes the humerus. It helps in extending shoulders and with the help of other rotator cuff muscles, it stabilizes the shoulder. It helps in abduction at the inferior angle of the scapula when the arm is fixed. It helps in the outward rotation of the head of the humerus. The primary muscle force that is needed for the external rotation of the shoulder is provided by the infraspinatus muscle. 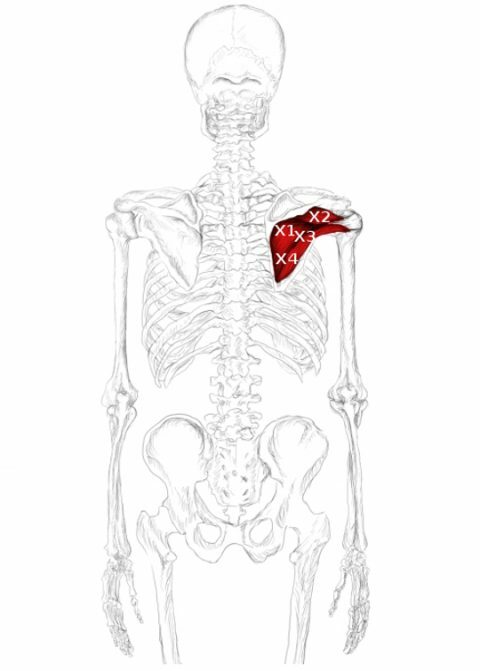 The infraspinatus with the rest of the Rotator Cuff muscles makes the shoulder complex stable. Athletes, musicians and desk workers are among the common victims of the Infraspinatus muscle pain. A person spending most of the day sitting in bend over position, doing a lot of desk work or with arm extended over the head are more likely to experience a troubling infraspinatus. If trigger points are present in your infraspinatus muscle, they can give you pain right at their location and send pain to other, seemingly unrelated areas of your body. The trigger points may be responsible for the pain at their own locations as well as to the areas of the body that are not even related to their locations. The trigger points in the middle and on the upper side (X1 & X3), shown in the diagram, below are responsible for extending the pain area to the upper neck and the shoulder. Sometimes, Biceps and inner elbow also become its victims. Trigger point no. 4 (X4) propagates pain to the inside and outside part of the shoulder blade and many a times, it gives a burning sensation.